http://www.NewsAndOpinion.com | A musical group called Dan Hicks and his Hot Licks recorded a song twenty-five years or so ago entitled "How Can I Miss You If You Won't Go Away?" That old song came to mind the other day upon hearing the latest strident remarks from former Vice President Al Gore. At a weekend retreat held for top Democratic fund-raisers, Gore bemoaned that his 2000 campaign had too many consultants and that if he runs for president again he will speak from the heart and "let it rip." Oh really? So does that mean that the last time he ran for president he wasn't speaking from his heart? You mean he wasn't being totally truthful with us? Oh, I get it -- when he ran in 2000 it wasn't the REAL Al Gore, but next time it really, really will be. Honest. I wonder just which Al will be running next time? Will it be "I Will Fight For You" Al? Will it be Earth-tone Al? Will it be Ecosystem Al? Will it be open-mouth soul-kiss Al? Will it be bearded professor Al? Or maybe a whole brand new Al will be unveiled. I can see the campaign slogan now, "The new, improved Al Gore for 2004." Gore ripped into President Bush, challenging the administration's war on terrorism, saying that "they haven't gotten Osama bin Laden or the Al Qaeda operation." In other words I guess big Al thinks he could have done a lot better. But he and his big buddy Bill had their chance to get the bad guys for eight years and they didn't. Oh, wait a minute. I forgot. That wasn't the REAL Al Gore back then. The problem with Gore is that he hasn't stopped campaigning. He learned that from Clinton. These guys just can't stop running for office even when there's no office to run for. Someone should tell Al that the election is over, the ballots have been counted ten thousand different ways, and he lost every time. Remember the good old days when a guy ran for president and lost and you never heard from him again? Guys like Walter Mondale and Michael Dukakis knew when it was over. They gave it their best shot, they lost, and then they went away. They maintained their pride and dignity and they resumed their lives. And they never stood up in public and put down the current President. 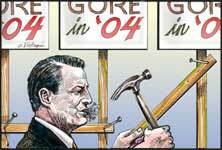 But Gore, like Clinton, has no life -- except the life of a professional political campaigner. For them, there is no pride and dignity to losing an election because for them winning is everything. Gore won't stop running for president because he has no other identity. Gore doesn't want to go away quietly and leave us alone. Are you kidding? -- he wants to be president, dammit! And Tipper is encouraging him big time. She told a Memphis newspaper recently that she wants her husband to run for president again. "I think we have the opportunity to really begin fresh with our own organization and way of doing things, which is very appealing to me in many ways," she said. Maybe she just wants to get him out of the house (although which house that is, is uncertain). They just purchased a third one for $2.3 million in Belle Meade, an affluent town of 3,000 boarding Nashville. They still own their family farm 40 miles east of Nashville, and a large home in Arlington, Va.
We should have known Gore was going to be trouble when he shaved his I-am-my own-man beard shortly after September 11th. At the time, though, I was fooled. I thought when Gore came back from Europe with that full beard, it was his way of finally conceding defeat. Saying, in effect, "Okay, I admit I'm a loser, so I've grown a beard and now will become a hermit in the hills of Tennessee." But when he shaved it off-- that was the clue that, uh, oh ... "he's ba-acck." For a guy who failed to carry his own home state in the 2000 presidential election, you wonder why he isn't ashamed. But, like Clinton, Al Gore doesn't know the meaning of the word, ashamed. He may be a loser, but he's no quitter. And, whether his party likes it or not, he isn't going away any time soon. Like another infamous Vice President who lost the presidential election, but came back to win it a few years later, it looks like we're going to have Al Gore to kick around for awhile longer.